Danny Welbeck has broken his ankle and undergone surgery, Arsenal head coach Unai Emery has confirmed. 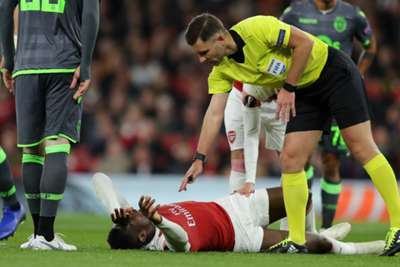 Welbeck sustained the injury against Sporting CP in the Europa League on Thursday and Arsenal confirmed the following day that he was still in hospital. And speaking at a news conference following Sunday's Premier League draw at home to Wolves, Emery confirmed widespread reports that Welbeck's ankle was broken. "Danny's injury is big," Emery told reporters. "We spoke with him yesterday and today. "We support him. I think he will not be with us for a long time." England international Welbeck was named in the Three Lions squad for a friendly against United States and Nations League clash with Croatia this week, but the striker now faces a long road to recovery. Emery, though, was unwilling to speculate on when Welbeck - whose contract expires at the end of the season - may be ready to return to action. "I think it's better for the doctor to say to you," he added. "It's a big injury but the outcome... the doctor can answer that better than me." Welbeck, 27, has had terrible luck with serious injuries throughout his career restricting his appearances for both Arsenal and former club Manchester United.